How to Impact Organizations and Get Things Done! Most organizations are hierarchical, social, political, competitive, and…frustrating! Get a running head start on the competition and learn what it takes to succeed in this environment. Many young people enter social, business, non-profit, or other organizations without the skills they need to be effective…or help move the organization (and themselves) forward. Often they don’t even know what the skills are. With Navigating in Organizations, you’ll learn tactics to navigate and help your organization meet its objectives while accomplishing your own goals. 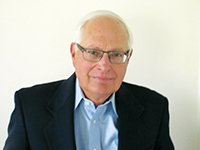 The book offers specifics on how to build personal and professional relationships; sell your ideas; effectively run meetings; impact meetings others are running; and six more critical how-to tactics. It includes 11 Don’ts—actions counterproductive to your and the organization’s effectiveness, such as “Don’t take things personally…but assume everyone else does.” The book also outlines 9 critical skills, such as public speaking and conflict management, and most chapters end with specific “Get Started” actions to implement the topic’s principles, along with a list of helpful resources. 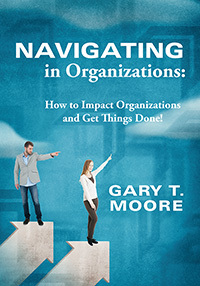 Throughout the book the principles discussed are illustrated with Real-World Experiences—short vignettes from author Gary Moore’s 50-plus-year career of “getting things done” in organizations!